PART I I: 2016 PROSPECTS FOR THE YEAR IN FOREIGN AFFAIRS AND NATIONAL SECURITY, OR AROUND MUCH OF THE GLOBE IN HALF AN HOUR! This second post looks at 2016 and it will examine at more of the most important global challenges and issues Americans and the rest of humanity will face in this year. In our first section we covered such issues as the Middle East, the Israeli- Palestinian Conflict, and Russia. In this part our focus will include Europe, China and East Asia and North Korea, It will look at possible developments in these key areas, what risks and dangers lie with the topics, and what policies or actions might affect outcomes good or bad. What America could, should, or should not do to address the dangers and problems inherent in each issue. In short, a quick tour of the most difficult questions our president and his successor will likely face. EUROPE: UNITY OR DISUNITY, DEMOCRACY OR FASCISM AND XENOPHOBIA? This year the European modal of integration is now in more danger of implosion than it has been for decades. In 2016 Europe is facing existential challenges of mass migration, the possible exit of Great Britain from the EU, movements towards authoritarian governments in Poland and Hungary and rise of far right parties. Add continued economic austerity policies which could help dismember the EU and widen the inequality gap, and not least a new threat from Putin’s more aggressive Russia on the EU’s Eastern Borders. For American long-term interests it is necessary for Europe to be united, democratic, and outward looking and a force in the world for doing good and helping international security, and working for peaceful solutions to problems. Without stability, economic growth, and continued commitment to democracy, and greater sense of united goals and purpose, Europe will wither and be a prisoner to its corrosive divisions and weak in responses to its key challenges. It will also not be able to be a true partner with the United States in the many global challenges we share in common. One path, as noted, is a Europe divided and weak and open to non-democratic forces of the racist far right, non-democratic anti-EU parties, or pressure from Putin. Is it a world where Europe does not support efforts to deal with the many global challenges that threaten all countries rich and poor. Or a Europe where Britain will not play a constructive role and falls to narrow-minded euro-skeptic xenophobia. The EU and NATO have helped to create a secure, peaceful, and prosperous region. My word for this historic goal is “One for all and all for One!” The alternative of Britain not continuing to be a key player in this effort is beyond anserine. It would be to its critical interest to do so and for the entire Europe and the world. France and Germany and other key EU countries need to keep their eye on the prize, which is a secure, prosperous fair economy for all citizens and especially the lest well off, and a commitment to share the burdens of our globes’s larger dangers and opportunities. The initial “deal” which is just emerging this February 19th between UK Prime Minister Cameron and the EU on the conditions for staying in the EU but with special rights of opting out of some EU responsibilities, may fly in a referendum on membership in the UK that could come in June 23 but there is still real danger that the result may be for withdrawal. But just the effort to carve out special rights makes Britain seem less reliable and less influential within the EU and builds costly resentment. Already many voices on the euro-skeptic right say the deal, even as revised this February, is too weak and will still campaign for an early exit. Looking beyond Europe, what could be the worst outcome would be for Europe to succumb to its worst forces and for America to do the same. One danger is “contagion” from America’s own bigoted and xenophobia tendencies that are all too evident in the likes of many of the Republican presidential candidates and Tea Party types. A Europe filled with similar right-wing crazies, would only contribute in an already high risk world to greater divisions and weakness of the Western democracies. We both had better head “the better angels of our nature.” or the forces of terrorism, xenophobia, fascism, and bigotry will, without a struggle, rise up and defeat decency and democracy without a whimper. America can make clear that it favors a strong democratic Europe, not the present path of Poland and Hungary, but rather that of the principles of the major EU Western nations, and give measured support to keeping the UK in the EU. But it must also lead by example itself. China is as much a problem as it is an opportunity. It is moving between more oppression and outward aggression and military assertiveness and at the same time trying hard to be seen as a responsible “great power” and an effective partner with other powers and nations. It seeks economic growth which can only come via peace not conflict. Its so called “islands” in the South China Sea are a large mistake and “bridge to far” which endangers, for little gain, its relations with key nation neighbors in South East Asia. Its assessment of its interests remains rather crude and counterproductive. Its economy and its policies in 2016 may show just how capable it is of ordering a peaceful and prosperous “rise.” 2016 will be a key test. Its policies towards Hong Kong and Taiwan will test also its wisdom and flexibility. Already on the economic front we see that the slightest change in its economy sends reverberations throughout the world. 2016 will see if they can manage wisely these transitions in their economy and their challenges and responsibilities especially to the millions of its very poor. It has shown some positive moves including agreeing to some restraint on its greenhouse emissions and it is moving to build more renewable energy sources. It supported the Iran nuclear agreement and clearly was unhappy with the North Korea’s nuclear and missile tests, but still sees the stability and continued government of that nation in its interests. Here continued intense dialogue with China and I add South Korea are vital. Already America is aiming to put anti-missile defense systems in South Korea which makes China worried. I predict that 2016 will be a year where the choices of being a global economy open to the world in trade and investment might struggle over a preference for a closed, more dictatorial and oppressive nation that sees military adventures as a means of enhancing the Communist Party’s hold on power. This last effort is doomed one way or another to be hurtful to China’s long term interests and well being. We need to give China some incentives to choose a path of cooperation and reform. Yes, America, Europe and Asian nations can to a certain extent influence some decisions by China to choose a peaceful “rise path” as it once proclaimed. But it is hard to be too optimistic given the trajectory of Xi government. American strategy however must be to continue an engagement and dialogue at every possible level to help shape a constructive China. This may take decades. But this all could go South if belligerence turns out to be its preference and others respond with growing military capability. In sum, the key struggles are between peaceful modernization and the tendency of harsh authoritarian rule. Chinese rising nationalism and their own far right militarist elements in 2016 pose a danger for China and beyond. NORTH KOREA AND THE NUCLEAR DILEMMA , ANY GOOD OPTIONS? The answer to this question is sadly no! But we are not without some tools for addressing the danger of a nuclear North Korea but none that are assured of a good outcome. As this is written not only has there been another “nuclear” test but also a missile test that is designed to be threatening to South Korea and Japan. America’s answer is to beef up our forces and provide for Japan and South Korea missile defense and other military assistance. We are holding more intense joint training and added military support. All well and good and needed. But again diplomacy and possibly sanctions with other nations especially China, is the best long run tool with North Korea that needs assistance from China mainly to maintain its beleaguered failing economy. North Korea is also a nuclear and missile trade “proliferation” threat that will need attention in 2016. This swill require the cooperation of other nations in stopping trade in weapons and other military and nuclear technology. So far this has proved to be at best a mixed outcome. Perhaps a more creative outreach to North Korea bu a group of powerful nations with a package of both incentives and “sticks” might prove in time some gains. In our next post we will take on the larger non-proliferation issues that include North Korea and others. The there will follow a third post in this series which examines some of our other challenges in 2016 and beyond, including looks at Nuclear proliferation, India-Pakistan, and global poverty and inequality, etc. Secretary of State John Kerry and Iranian Foreign Minister Mohammad Javad Zarif resume nuclear negotiations on March 15, 2015. It is now agreed that the Iran nuclear talks will resume on March 15th and this session will be focused on the remaining key “macro” political issues that are still outstanding. There are indications on both sides that a deal may at last come together. However, they all say “but nothing is agreed upon unless everything is agreed on,” that there are a lot of difficult issues that remain, and that there are strong opponents of any deal on both sides. This weekend we have been seeing statements from the “P-5 plus one” (The United States, China, France, Germany, Russia, the United Kingdom), that some progress is in the cards during the next meeting. President Barack Obama said “We have made progress in narrowing the gaps, but those gaps still exist.” On the European side, EU foreign policy chief Federica Mogherini said at a meeting in Latvia, “I believe a good deal is at hand. I also believe that there is not going to be any deal if it is not going to be a good deal.” She added the “last mile” of the nuclear talks would involve political will more than technical negotiations. All of these statements are contingent on the final requirement that both sides desire a “good” agreement and are willing to pay the political price for such an agreement. 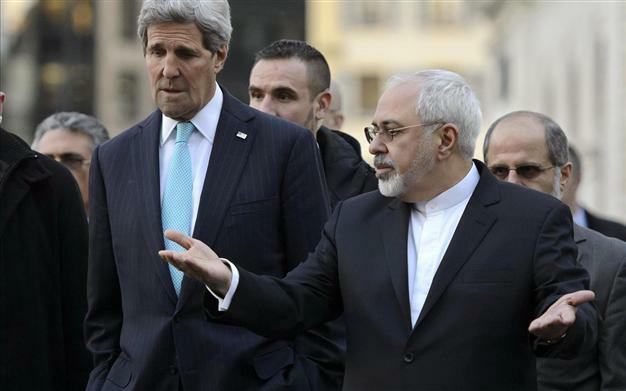 Iran especially needs to accept that a nuclear “option” is not in its fundamental interest. The administration has said that this agreement does not require Senate ratification since it is not a treaty but an executive or political agreement between governments. The president can wave some of the sanctions but not all of them and this issue is a sticking point. On the Iranian side there remains opposition from hard liners, but I doubt that Zarif would be able to proceed unless he was given authority to do so from the highest authorities. Yet any “political” or “framework” agreement would still have to be sent back to the “experts” for specific drafting and review before a formal agreement was signed. This could take months, not weeks. In Congress the Republicans seem determined to veto any agreement they do not like. It looks sadly like many Republicans will oppose even a “good and strong” agreement. They were stopped from pushing forward a GOP plan to act before the March 31st negotiating deadline by the Democrats since the fear was that by before the negotiations ended, Congress would act on a draft anti-agreement legislation that would undercut and indeed put up a series of barriers against any realistic agreement coming into existence. The question now is whether the Democrats can hold together against such a plan should an agreement be settled. The more recent news is the surprising and most duplicitous action by 47 Republican Senators who have interfered and intervened into on-going delicate negotiations with Iran to limit their nuclear program. This was done on the brink of the start of new high level meetings of the key powers in Geneva and is a direct affront to the President who under our constitution has responsibility for foreign affairs. As the New York Times Tuesday March 10th front page story reporting characterized it: “The letter appeared aimed at unraveling a framework agreement even as negotiators grew close to reaching it.” The partisan effort was criticized by President Obama, and very strongly by Vice President Biden who denounced the Senate Republicans. Click here for the Vice President’s Full Statement. President Obama’s statement was: “It is somewhat ironic to see some members of Congress wanting to make common cause with the hard-liners in Iran. … It’s an unusual coalition.” I was for 25 years a diplomat and have never experienced such a direct effort by one party to directly deal with undermining a major sensitive and important to our national security high level nuclear negotiations. Click here for the full text of President Obama’s Statement in Reaction to Israeli Prime Minister Netanyahu’s speech regarding Iran Nuclear Negotiations. From a macro strategic perspective, such an agreement could have major implications upon the possibility that limited rapprochement could ensue, and a broader set of regional issues, not least how to deal with ISIS, and a effort to reconcile the Shia-Sunni divide and even get Iraq unity back on track. As with all such deep and historic acrimony, nothing is certain and unpredictable change is always lurking on the sidelines to reappear when it is politically expedient for one side or another. But if America and our allies are to help a process of reconciliation in the region, they need to take the long-view and work very hard at it despite any setbacks. Below is the list of Republican Senators who signed and didn’t sign the Open Letter to Iran that was written to undermine the President’s negotiations. Cyprus in the News – but Where?